Lab tests are key to understanding how your body is working. Wilson Medical Center's laboratory services offer a wide range of tests to help physicians diagnose and manage patient conditions like diabetes, high cholesterol, etc., aides in the prevention and treatment of disease, and tracks the recovery progress. We are committed to the mission of improving the health of our patients. Sophisticated, automated equipment - as well as manual methods - is used to perform complex testing. We perform your tests as quickly and accurately as modern technology allows and make the results readily available to your physician. 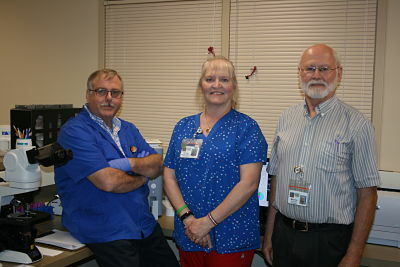 Our laboratory is available for patient care testing twenty-four hours a day, seven days a week for inpatients, while much of the outpatient testing is done during our business hours of 7:00 am to 5:00 pm, Monday through Friday. These convenient hours ensure that you may time your *Fast (see below) accordingly, and have your specimen collected first thing in the morning. Afterwards, you may resume your normal diet. No. Lab tests are performed on a walk-in basis. How do lab tests help maintain your health? The quality and accuracy of your laboratory test results are used by your doctor to diagnose your health and, if needed, develop a course of treatments and measure the effectiveness of your treatments. In fact, a standard statistic is that 70% of the measurable data in a patient's medical record are laboratory results. When your lab work is performed at the Wilson Medical Center Laboratory, the results become part of your comprehensive medical record and are used to make important diagnostic and treatment decisions that affect your health. Do I need to check in at registration every time I come in for a lab test? Yes. Each time you come in for testing, your insurance company sees it as an individual visit. They require that you have a new account number, insurance verification, and your consent for treatment for each visit. Should I take medications before my blood draw? It depends on the medication and how it is taken. Please ask your doctor about your medications before your specimen collection. My paperwork says to "Fast". What does that mean? Please refer to the fasting information contained on lower section of this page. Do I HAVE to fast for my test? Many lab tests DO require fasting; however your provider should tell you if you are required to fast for your lab tests. If you're not sure, please check with your provider. Generally, all glucose, cholesterol or lipid testing require an 8-12 hour fast. You have a right to get a copy of any of your test results from our Medical Records Department. An Authorization to Release Protected Health Information will be requested by the Medical Records Department, giving us legal permission to give you a copy of your laboratory results. Results are not usually ready immediately, so you may need to come back to the laboratory to get your results. When will my physician have my results? The tests you have performed will determine how quickly your provider will receive your completed results. Some results are available within hours, while others take a few days to complete. What do my results mean? Who will explain them to me? Only your provider can interpret your results and what they mean for you. For general information on laboratory tests and what they mean, go to www.labtestsonline.org. How much blood will be collected? We know it looks like a lot, but it's really not! A typical tube holds about 1 teaspoon of blood. A typical person has about 14 pints of blood in their body, which is about 1,344 teaspoons. Even if we collect more than one tube of blood, you can see that it's not very much compared to how much you have in your body. Do not eat or drink anything (except water) during the time period stated before you go to the laboratory to have your specimen collected. You may drink water, but no juice, tea or coffee. Please call us at (620)325-8312 if you do not see your test listed or if you have questions not answered on this page.